Lately I've been getting into more colorful makeup. And by lately I mean the last couple of months. So I've invested in couple of kind of bright palettes and one of them I want to share with you today. 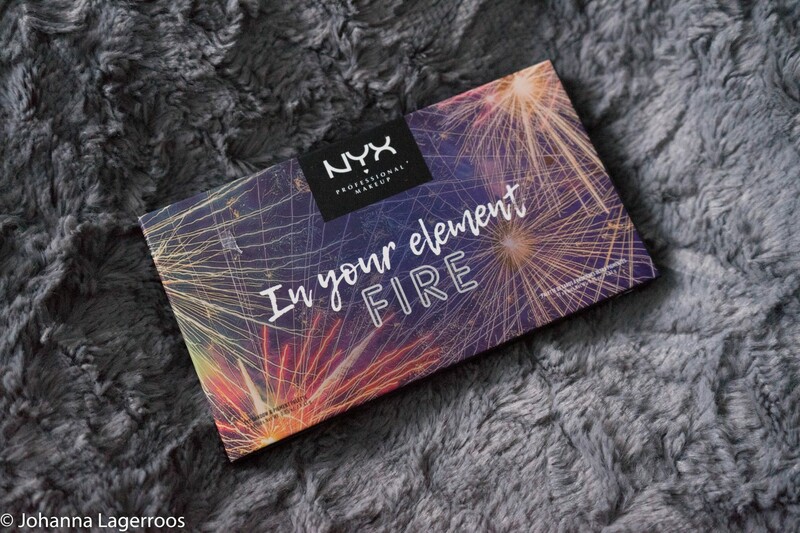 If you saw my March purchases post, you know I bought NYX In Your Element Fire palette. I've been wanting to expand from neutral makeup to bit more fire colored ones, and after some searching I figured I loved this one's color story enough to get it. It has a balance of mattes and shimmers, brights and neutrals. I've been absolutely loving this palette, and if you follow me on Instagram, you might have seen looks created with this one. I think the packaging itself is very fun, although maybe not entirely in line with what's inside. I personally don't think about fireworks when it comes to the colors, but more really about flames and fire. The palette comes with mirror, which is not a factor for some, but I do like it when a palette comes with mirror. I carry my go-to palette of each time a lot with me, so having a mirror is usually a plus. It has a lot of product in it, and I think I'll have use from this for a long time. The palette also swatches quite nicely, these are done with fingers, swiping each color two times to get them vibrant. Although I'm so pale that most colors show quite well on my skin. 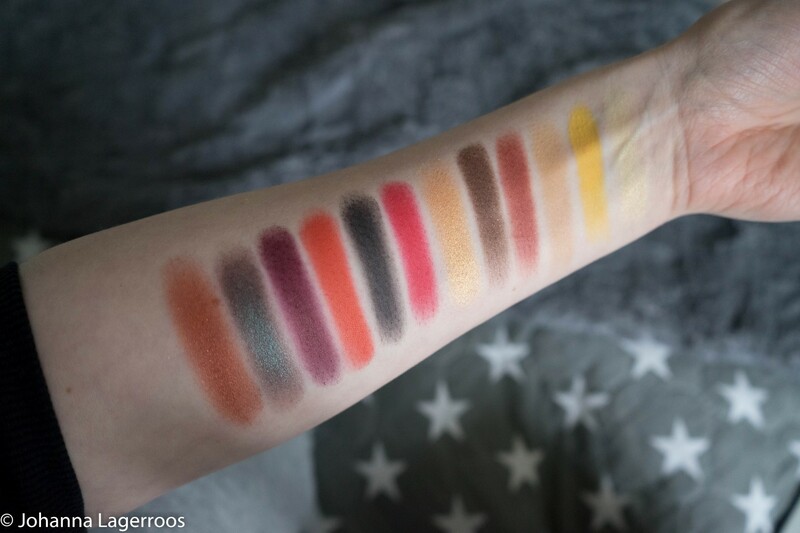 Even looking at the swatch pic now gives me many ideas for eye looks I want to create. I'm especially in love with the bright matte red, orange and yellow, but I do like all the shades in this palette. 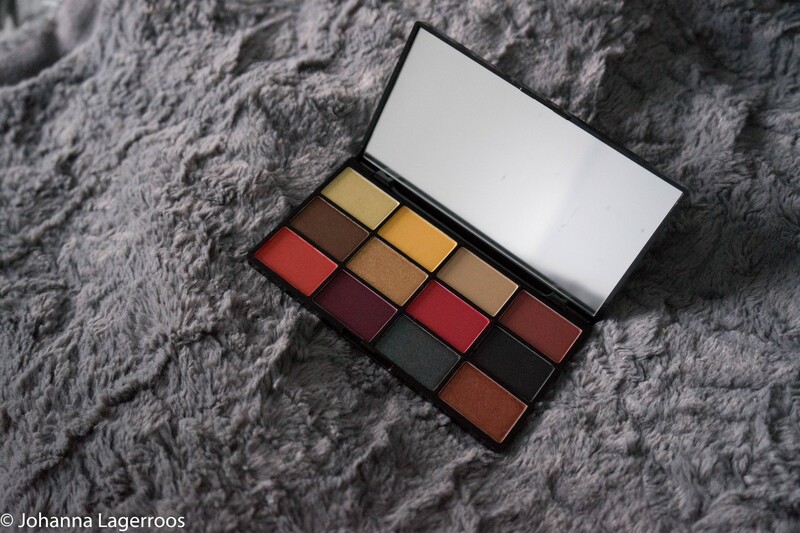 This is probably better palette for autumn and winter due to the dark shades in it, but it definitely works for summer makeup as well if you use a little lighter hand and/or use mainly the brighter colors. That being said, there's no right or wrong in makeup so if you want to rock a dark smokey eye at daytime in summer, you do that. If you like it, just do it. Below, I collected some looks I've shared on Instagram using this palette. I hope these give you any idea how versatile the palette can be if you just experiment a little. Personally I feel like this palette was a pretty much perfect purchase for me, who is learning to get out of the neutral smokey eye/all neutral makeup comfort zone. I love that you can make a neutral look with the palette, but at the same time you can go all out and do a look that's very out there. I do recommend this palette if you like warm colors in your eye makeup, and if you're like me and want a little push towards the brighter looks. What do you think about the palette? And, what is your favorite eyeshadow palette? Let me know in the comments! That's all for today, and I'll be back very soon with another post. If you want to hear from me more often, please follow me on Instagram, where I post content daily - mostly style related stuff, but every now and then also more. 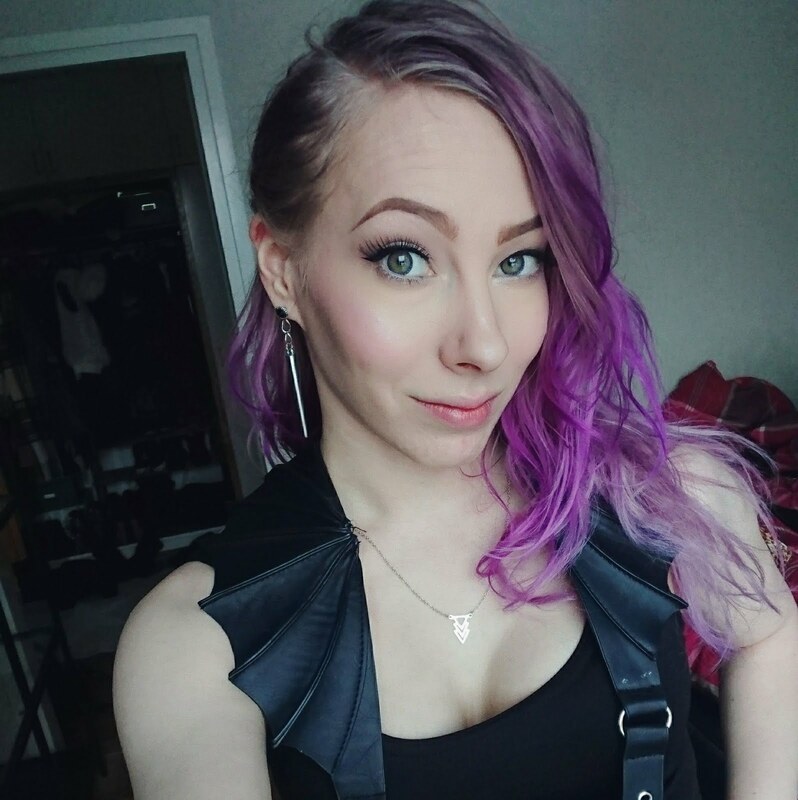 You can find me as @silvertigo, so please come and say hi! I'll see you all in the next post!